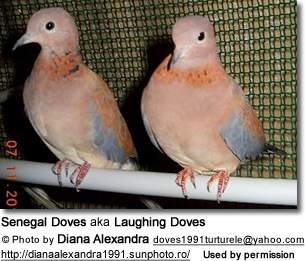 NOTE: Most of the beautiful species photos on this page have been contributed by Diana Alexandra - a breeder / keeper of these African doves. 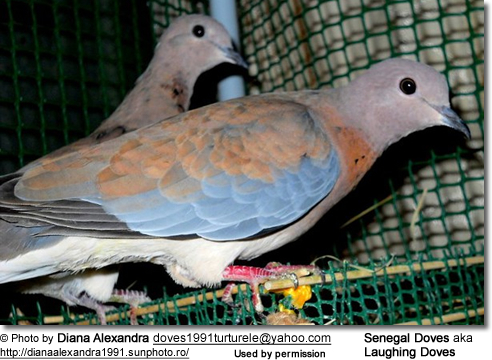 The Laughing Doves (Spilopelia senegalensis) are small African pigeons that were named for their distinctive coo vocalizations that are reminiscent of human laughter. Regionally, they are also known as Indian Little Brown Doves, Laughing Turtle Doves, Little Brown Doves, Palm Doves and Senegal Doves. 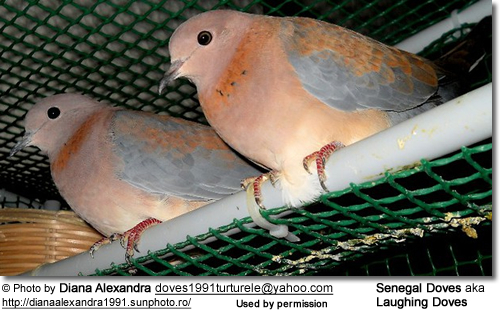 Laughing Doves are distributed throughout tropical Africa, avoiding the Sahara, Gabon, southern Cameroon and the central areas of the Democratic Republic of the Congo. Some subspecies are also found in the southern part of the Arabian Peninsula (situated north-east of Africa), Iraq, Iran, Afghanistan, Pakistan to central and southern Asia (except Nepal and Bhutan) and the Indian sub-continent (not in Sikkim). They are found in woodland areas, semi-desert habitats, on dry farmland, in scrub, thornbrush, suburban parks, villages, Acacia plantations and gardens- any area with easy access to water (within 6 miles or 10 km). They are typically seen alone or in pairs - rarely in larger groups. In urban areas, they can become quite confiding. Except for some local movements in response to availability of food and water, these doves are resident (non-migratory) within their range, and regionally common and widespread. Above: Noddy with his new buddy "Lucky" - the canary. He was called Lucky because he came from a tiny cage in a pet store. and now his cage is 20 times the size of the one he was in. Lucky was singing like Pavarotti. Slight differences in plumage details, size and vocalizations exist between the different subspecies. Populations from more arid zones tend to have a paler plumage. Range: Sub-Saharan Africa and western Arabia from Medina in Saudi Arabia south to Aden and Mukalla in southern Yemen. 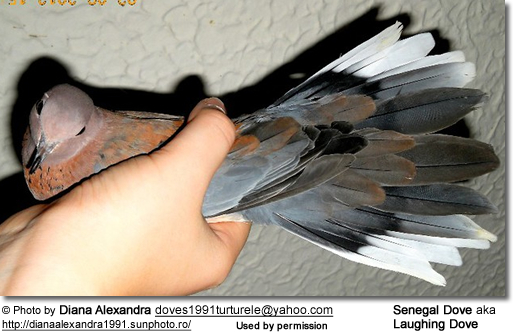 ID: Bluish-grey rump and upper tail feathers. Range: Northeastern Africa in the Nile Valley region - from Suez Canal and delta south to Wadi Halfa. ID: Larger in size ; the head and nape (back of the neck) are vinous and the upper wing coverts are rufous-colored. Eastern Arabia and eastern Iran north and east to Kazakhstan and western Xinjiang (northwestern China), and east to Pakistan, India and Bangladesh. ID: Smaller and duller than the nominate form. It is less rusty on the upperparts and the rump has a smaller area of blue-grey. The back is uniformly dull brown in the Indian population. 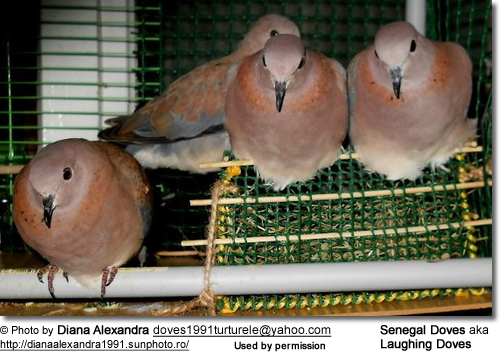 The small, long-tailed, short-winged, slim Laughing Doves generally measure between 9 - 10 inches (23 - 26 cm) in length and have a wingspan of 15.7 - 17.7 inches (40 - 45 cm). The plumage is mostly blotchy reddish-brown with some blue-grey markings on the wings, and dark grey remiges (large flight feathers). The outer tail feathers have white tips. In flight, the rich chestnut colored underwings can be seen. 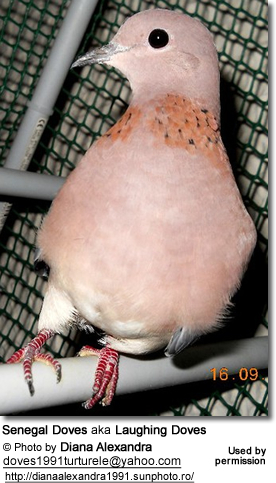 The head and neck are pinkish / lilac tinged, shading to buff on the lower belly. There is black spotting on the throat. Some abnormal leucistic (pale-colored) plumages have also been noted. The bill is black. The legs are reddish or purplish. The tail is graduated (= the tail is moderately pointed and the tail-feathers decrease in length from the center pair outward.) Their flight is described as "quick and direct with the regular beats and an occasional sharp flick of the wings." Males and females are identical. Immature birds have a more rufous plumage and the spotting on the neck / throat are either absent or reduced. 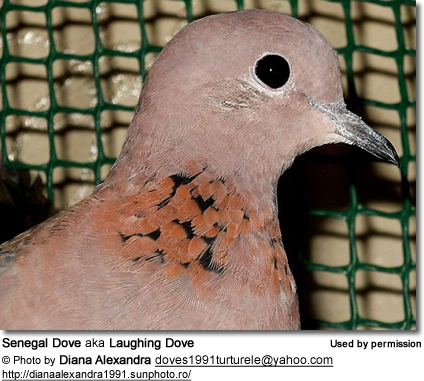 The Laughing Doves are most easily identified by the distinctive rufous and black neck pattern, and by their human laughter-like vocalizations. 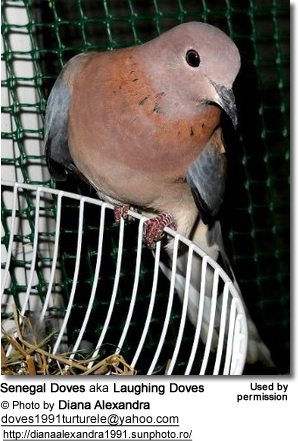 The similar European Turtle Doves have black and white markings on the side of the neck and uniformly brown backs that lack the flack feather centers. They also have longer tails and shorter wings. The diet of Laughing Doves consists of grass, fallen seeds, grains, other vegetation and small ground insects (such as termites and beetles). They usually forage on the ground in grasslands and cultivated areas. Even though they are generally seen in pairs or small family groups, in dry areas large flocks of them may assemble in trees near waterholes. 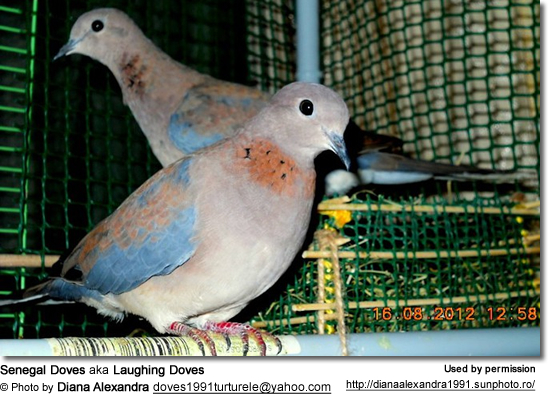 Laughing Doves are strictly monogamous, forming pair bonds that last a lifetime - although they will replace lost mates. 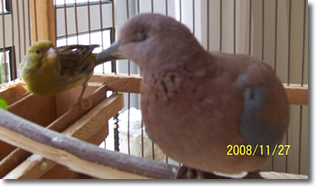 Bonded pairs are often seen preening and feeding each other. The breeding season varies by location. In Malawi (southeast Africa), they may breed throughout most of the year. In Zimbabwe (Southern Africa), they mainly breed from May to November. 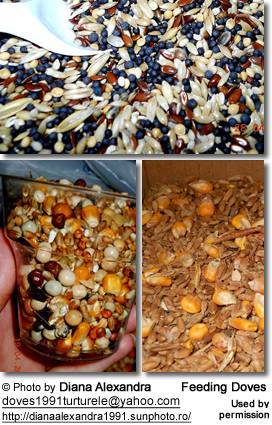 In Egypt and Tunisia (North Africa) most breeding activities are observed from February to June. In Turkey, they breed throughout most of the year; and in Australia mainly from September to November. In order to solicit copulation with the female, the male performs courtship displays that often entail head bobbing, pecking at his folded wings in something that is commonly referred to as "displacement-preening", launching into the air with wing clapping sounds followed by gliding down in a gentle arc, as well as cooing to the female. He is also observed feeding the female before the act of mating. Both parents construct the flimsy platform nest out of twigs. The twigs are usually brought to the female by the male and the female incorporates them into the nest. Their nests are typically located in low bushes, in trees and crevices. 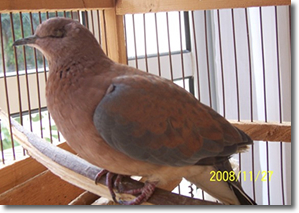 In urban areas, they may nest on window sills, on top of buildings or under the eaves of houses. Nests are often reused for several seasons. The average clutch consists of two white eggs, which are incubated for about 13 - 15 days. The task of incubating (brooding) the eggs is mostly performed by the female; however, during the day the male takes over to allow her to feed, drink and bathe herself. Should they feel that their eggs or young are threatened, these doves may feign injury to distract and draw predators away from the nest. The young fledge when they are about 14 - 16 days old. 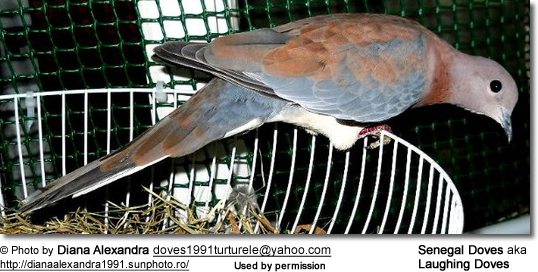 The Laughing Dove was named for its low rolling, hollow croo-doo-doo-doo-doo chuckling call that is reminiscent of the human laughter. The 3rd and 4th syllables are a little higher-pitched. 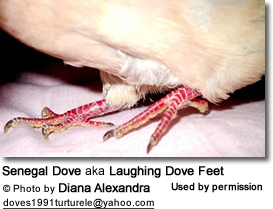 Diana Alexandra recommends these gentle doves for those wishing to keep birds that are quiet and non-aggressive towards other birds. She describes these birds as very timid and easily frightened. Therefore, she recommends keeping them in an undisturbed area with plenty of sun and natural light. The constructed her loft out of plastic garden green mesh (as can be seen on some of the photos) and she used plastic tubes for mesh support. Their nests are made of twigs and dry grass. For easy clean-up, she put linoleum on the floor. She scrapes hardened feces with a spatula and removes the linoleum once a week to wash it with a shower. She feeds the doves with small grain bought from pet shop for finches and tiny doves; provides fresh water every morning and always allows her doves access to a bowl with sand and rocks for good digestion. 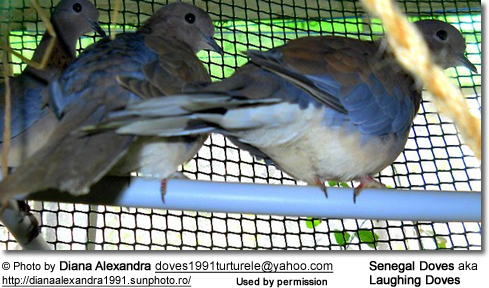 Her doves love to bathe in warm water, which will help keep their plumage clean and in good condition.